Signal analysis of pineapple according to its anatomical region in magnetic resonance cholangiopancreatography: Which region is most effective in suppressing gastric fluid signal? Purpose: Pineapple juice is an oral contrast agent, due to its paramagnetic property, it is used to suppress gastric fluid signal and prevent superimposition artefacts in Magnetic Resonance Cholangiopancreatography (MRCP) examination. The aim of this study is to in vitro investigate the effective usage of pineapple by depicting the signal characteristics of its morphological regions and its signal characteristics. Materials and Methods: Five naturally harvested pineapple were examined in axial-coronal planes using TSE-T2 (Turbo spin echo) sequences in a 1.5 T MR device. The plant was divided into apical, midcranial, middle, mid-caudal and basal levels. In each level, 10 randomized sampling were obtained from ovary, sepal and peduncle segments using ROI. Pineapple juice was used as control group. Results: The average signal obtained from a total 50 control group was 58.55 ± 12.47; from sepal, peduncle and ovary segments in 5 pineapple was 27.25 ± 3.90, 194.63 ± 62.38 and 166.2 ± 31.3, respectively (p<0.001, p<0.005). The average signal of sepal segment was lower than control group (p<0.001). Conclusion: Concentrated pineapple juice that is routinely used in MRCP examination is a mixture of sepal, ovary and peduncle segments which may cause global increase in signal intensity and decrease homogeneity. Sepal parts of the fruit shows lowest signal suppression on MRCP sequences may have effective gastric fluid signal suppression. Magnetic Resonance Cholangiopancreatography (MRCP) is a non-invasive imaging technique that provides assessment of pancreaticobiliary system, using heavily T2-weighted sequences to get inherent contrast effect of bile. For MRCP to be diagnostic the technique should be free of artifacts and a well suppressed T2 fluid signal should be obtained. For this purpose, negative contrast agents such as manganese are preferred. Manganese is an essential trace element and has paramagnetic properties (electron configuration is 4s2 3d5). Manganese tends to increase T1 signal intensity, shorten the T2 relaxation time, reducing T2 signal of the fluid resulting in the suppression of fluid signal [1,2]. Pineapple contains manganese enabling a natural negative contrast. With its known paramagnetic property, pineapple juice (PJ) is used to suppress the gastric fluid signal and prevent the superposition artefacts particularly in MRCP examination. However, due to its morphological structure and preparation, the obtained PJ has multisegmental solid contents and also heterogeneous signal properties. In this article, we aimed to in vitro investigate the effective usage of pineapple by depicting the signal characteristics of its morphological regions and determining its signal characteristics, in the light of literature. Five naturally harvested pineapples (Dole Plantation) were examined in axial and coronal planes obtained by FSE-T2 sequences in a 1.5 Tesla MRI scanner (Optima 360; General Electric Healthcare Technologies, Milwaukee, Wisconsin, USA). A standard MRCP sequence protocol (TR: 8500 ms, TE: 800 ms, Matrix: 256 × 256, FOV: 30 × 18 mm, Thickness: 3 mm, Bandwidth: 31.2, ET: 13, NEX: 3) and 1.5 Tesla Superconducting MRI unit, Synergy transmit/receive body coil were used. The plants were divided into apical, mid-cranial, middle, mid-caudal and basal levels (Figure 1). In each level, 10 randomized ROI (Region of Interest) sampling with equal measurement units (0.51 sq.cm, 104 pixels) were obtained from ovary, sepal and peduncle using Leonardo Workstation (Siemens, Erlangen, Germany) (Figure 2). Minimum, maximum mean values and standard deviation of each ROI were noted. PJ (Sunprice 1000 ml) was used as control group. Three cups of 100 ml containing PJ were scanned by MRI, each of them was calculated using the same parameters and obtained data were noted. Figure 1: Classification of plants into apical, mid-cranial, middle, mid-caudal and basal levels. 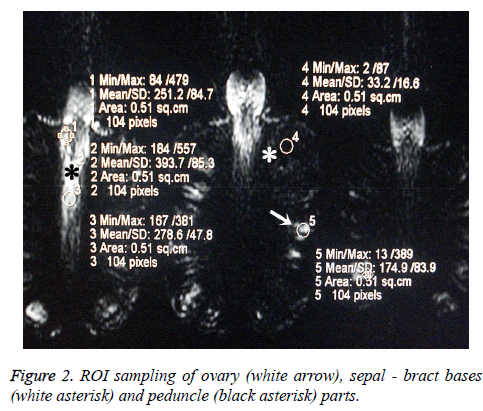 Figure 2: ROI sampling of ovary (white arrow), sepal - bract bases (white asterisk) and peduncle (black asterisk) parts. Statistical analysis was performed by SPSS statistical software (SPSS Inc. Chicago, IL) using One-Way ANOVA (analysis of variance) and the independent sample t-test. The data was evaluated in 95% significance interval (A p<0.05 was considered as the threshold for statistical significance). The average signal obtained from a total 50 control group (total number of ROIs measured in the pineapple juice samples) was 58.55 ± 12.47. The average signal obtained from sepal, peduncle and ovary segments in 5 pineapple was 27.25 ± 3.90, 194.63 ± 62.38 and 166.23 ± 31.3, respectively (p<0.001, p<0.005) (Table 1). The average signal of sepal segment was lower than control group (p<0.001). Table 1: Statistical segmental signal analysis of pineapple. For an optimal abdominal MR imaging and MRCP, the contrast agent that is used must provide non-superimposed visualization of pancreatobiliary system. An ideal contrast material should be well tolerated, non-toxic, safe, available and cost-effective. It should also provide homogeneous fluid signal suppression and uniform distribution in the Gastrointestinal Tract (GIT), and should not be diluted during its trajectory and not stimulate peristalsis . Ferumoxsil is an artificial negative oral contrast agent which has superparamagnetic properties, containing a colloid suspension of iron oxide particles coated with siloxane . Artificial oral contrast agents are not well tolerated by patients and they may have adverse effects such as teeth stains, gastric irritation, vomiting, diarrhea and constipation [3,4]. However when oral contrast agents (such as blueberry, mulberry, pineapple juices, water, tea) are used, these adverse effects are not seen [1,3,5]. Pineapple juice is a natural and negative oral contrast agent which is ideal for abdominal MR imaging and MRCP. Due to its high manganese content, it shortens T2 relaxation time, reducing T2 acquisition signal of fluid, therefore suppressing fluid signal in the GIT . As the fluid located in gastric fold or duodenal bulb may mimic pathologies leading to misdiagnosis such as irregular pancreatic duct as seen in chronic pancreatitis or gallbladder containing calculi . In their study, Riordan et al. compared T2 shortening effect of PJ and ferumoxsil which is a commercially available negative contrast agent. They stated that PJ shortened T2 relaxation time nearly a similar degree to ferumoxsil. They used a variety of available beverages as contrast materials (orange, grapefruit, apple, prune, cranberry, blueberry, pineapple juice, milk) and standard radiological contrast agents (Barium EZ, dilute barium, concentrated gastrografin, ferumoxsil) and water as control group. They performed T2 and T1-weighted TSE (turbo spin echo) and single shot MRCP radial sequences. On T2-weighted TSE they found PJ to have the lowest relative signal intensity compared with other fruit juices, milk, barium and gastrografin. However PJ had higher relative signal intensity than ferumoxsil. On T1-weighted TSE, PJ had the highest relative signal intensity. On single shot MRCP radial sequence PJ had the lowest signal intensity, apart from ferumoxsil and gastrografin . As a similar study, Alshehri compared the image quality of MRCP by using negative oral contrast agents (PJ or ranitidine) and without using any agent. It was found that both PJ and ranitidine are able to better improve the image quality of MRCP by eliminating the gastrointestinal fluid. Although there was no statistically significant difference between the two agents, the image quality of MRCP with PJ was slightly superior to that with ranitidine. This may have been due to difference of the T2- shortening and the paramagnetic effect of the relatively high concentration of manganese in PJ. There was a comparable performance of PJ to that of conventional ranitidine in terms of pancreatic and biliary depiction and safety . Also Bittman et al. described their five years of experience with certain brands of acai juice, blueberry juice and pineapple juice as negative oral contrast agents in children. They stated that using of these fruit juices are safe, palatable and may improve MRCP image quality without significant additional cost . MRCP requires at least four-hour starvation before the examination. Using 150-300 ml per-oral pineapple juice 20-30 min prior to the study provides homogeneous suppression of gastric and duodenal fluid signal and enables better visualization of the anatomical details such as ampulla of Vater, the common biliary duct and the common hepatic duct . PJ is commercially available as different trademarks. Because of its inhomogeneity, in routine practice before using, PJ bottle is shaken for short time to make it as a homogeneous solution. Pineapple has some morphological parts including peduncle (inflorescence axis-the core), sepal and bract bases, ovary (Figure 3) . The soluble solid content (such as manganese) is lowest at the distal (crown) end and increasing toward the proximal (peduncle) end . In industrial field, PJ is prepared by compressing and crushing, followed by gathering whole parts contents of the fruit including ovaries, peduncle and bract bases. PJ is natural negative contrast agent which contains a high level of manganese concentration (2.76-3 mg/dl) [1,11]. Available concentrated pineapple juices are being prepared as mixed juices because they contain all of the anatomical segments and have heterogeneous signal intensity. For more effective and optimal MRCP study and suppressing gastric fluid signal the more, it is recommended preparing pineapple juices from the lowest signal calculated regions which are representative of sepal parts. However, it may increase the cost. Figure 3: Morphological segments of pineapple. In several series, oral contrast agents and their magnetic properties have been studied [12-17]. However to our knowledge, there have been no studies searching the morphological signal characteristics of pineapple according to segmental classification. The current study depicts the signal properties between different segments of pineapple. As its manganese content, is highest in sepal- bract bases part and lowest in peduncle , the signal intensity will be different. In this study, signal analysis of the fruit regarding its paramagnetic content properties showed the highest signal at distal portion while it was lowest toward the proximal end (Table 2). We believe that, this property regarding the variation of manganese content leading to low or high signal intensity may be used in preparing more efficient PJ. Hence, during routine clinical practice PJ may provide a more optimal imaging for MRCP purposes. NS: Number of Sampling; SD: Standard Deviation. Table 2: Signal variety of sepal-bract bases from distal toward the proximal end. The limitation of the current study is that the solid contents of pineapple constituents are not measured in vivo. We think that, comprehensive studies may be held in vivo to show the efficacy of the pineapple in which the high paramagnetic portion of the fruit is used. Concentrated pineapple juice that is routinely used in MRCP examination is a mixture of sepal, ovary and peduncle segments which may cause global increase in signal intensity and decrease homogeneity. Sepal parts of the fruit shows lowest signal suppression on heavily T2 weighted MRCP sequences. During the preparation of PJ, it is recommended to keep these facts in mind. Riordan RD, Khonsari M, Jeffries J, Maskell GF, Cook PG. Pineapple juice as a negative oral contrast agent in magnetic resonance cholangiopancreatography: a preliminary evaluation. Br J Radiol 2004; 77: 991-999. Duarte JA, Furtado APA, Marroni CA. Use of pineapple juice with gadopentetate dimeglumine as a negative oral contrast for magnetic resonance cholangiopancreatography: a multicentric study. Abdom Imaging 2012; 37: 447-456. Cordova-Fraga T, de Araujo DB, Sanchez TA. Euterpe Oleracea (Acai) as an alternative oral contrast agent in MRI of the gastrointestinal system: preliminary results. Magn Reson Imaging 2004; 22: 389-393. Espinosaa MG, Sosab M, De Leon-Rodriguezc LM, Cordovad T, Bernal-Alvaradob J, Avila-Rodri´guezc M. Blackberry (Rubus spp. ): a pH-dependent oral contrast medium for gastrointestinal tract images by magnetic resonance imaging. Magn Reson Imaging 2006; 24: 195-200. Giovagnoni A, Fabbri A, Maccioni F. Oral contrast agents in MRI of the gastrointestinal tract. Abdom Imaging 2002; 27: 367-375. Fulcher AS, Turner MA. Pitfalls of MR cholangiopancreatography (MRCP). J Comput Assist Tomogr 1998; 22: 845-850. Alshehri FMA. Comparative study of pineapple juice as a negative oral contrast agent in magnetic resonance cholangiopancreatography. J Clin Diagn Res 2015; 9: 13-16. Bittman ME, Callahan MJ. The effective use of acai juice, blueberry juice and pineapple juice as negative contrast agents for magnetic resonance cholangiopancreatography in children. Pediatr Radiol 2014; 44: 883-887. Deeckenbrugge GC, Leal F. Morphology, anatomy and taxonomy. The Pineapple Botany, Production and Uses. Oxon: CAB International 2007; 13-20. Peiris KHS, Dull GG, Leffler RG, Kays SJ. Spatial variability of soluble solids or dry-matter content within individual fruits, bulbs, or tubers: implications for the development and use of NIR spectrometric techniques. Hort Sci 1999; 34: 114-118. Hiraishi K, Narabayashi I, Fujita O, Yamamoto K, Sagami A. Blueberry juice: preliminary evaluation as an oral contrast agent in gastrointestinal MR imaging. Radiology 1995; 194: 119-123. Hirohashi S, Hirohashi R, Uchida H, Kitano S, Ono W. MR cholangiopancreatography and MR urography: improved enhancement with a negative oral contrast agent. Radiology 1997; 203: 281-285. Laubenberger J, Buchert M, Schneider B, Blum U, Hennig J. Breath-hold projection magnetic resonance-cholangio-pancreaticography (MRCP): a new method for the examination of the bile and pancreatic ducts. Magn Reson Med 1995; 33: 18-23. Petersein J, Reisinger W, Mutze S, Hamm B. Value of negative oral contrast media in MR cholangiopancreatography (MRCP). Rofo 2000; 172: 55-60. Obenauer S, Fischer U, Heuser M, Wilke R, Grabbe E. The optimization of MR cholangiopancreatography. Rofo 1999; 171: 450-454. Lecesne R, Drouillard J, Cisse R, Schiratti M. Contribution of Abdoscan in MRI cholangio-pancreatography and MRI urography. J Radiol 1998; 79: 573-575. Blandino A, Gaeta M, Mazziotti S, Settiner N, Pandolfo I. Use of oral superparamagnetic contrast media in cholangiopancreatography with TSE single-shot magnetic resonance. Radiol Med (Torino) 1998; 96: 87-91.